The statement references Schuette’s involvement in a pair of lawsuits against U.S. Environmental Protection Agency regulations largely affecting coal-fired power plants. One lawsuit challenged the agency’s authority to curb emissions of mercury and other air toxics. The other concerned EPA’s authority to slash greenhouse gas emissions. Now, those same lawsuits are under scrutiny from a liberal advocacy group, Progress Michigan, which claims the suits show Schuette protects polluters. Like much of politics, the claim focuses on one aspect of an issue (pollution) rather than another (protecting jobs). Nonetheless, the assertion is accurate, and Schuette’s campaign didn’t directly rebut Progress Michigan’s assertions to Truth Squad. First thing’s first: Can coal plant emissions trigger asthma? Yes, and worse. Progress Michigan backs up its assertion by pointing to a 2011 report from the American Lung Association. That’s a Washington, D.C.-based research and advocacy group that seeks to prevent lung disease and relies on dozens of health and medical advisers. The 2011 report details a litany of hazardous pollutants from coal-fired power plants. Those include acid gases, benzene, dioxins, formaldehyde, lead, arsenic and mercury. Peer-reviewed studies have suggested that living near coal plants increases the risk of hospitalization for asthma or other lung diseases. That includes a 2012 study in the journal Environmental Health Perspectives. In 2011, the EPA issued new limits on coal plant pollutants, including mercury, arsenic and other toxins, saying the effort would limit such health effects. In 2014, after a federal court upheld the standards, Schuette petitioned the U.S. Supreme Court on behalf of Michigan and 20 other states, seeking to block the rule nationwide. Schuette claimed the costs for implementing the rule “would be borne by consumers of electricity” and would outweigh the health benefits. A year later, the U.S. Supreme Court issued a 5-4 ruling on Schuette’s suit that ordered EPA to reconsider the rule because it had failed properly to weigh the costs of the measure versus its benefits. That’s the decision Schuette touts in his appeals to Republican voters. But in 2016, the high court again weighed in, declining to intervene in a lower court ruling in the case that upheld EPA standards.That was seen as a loss for Schuette. 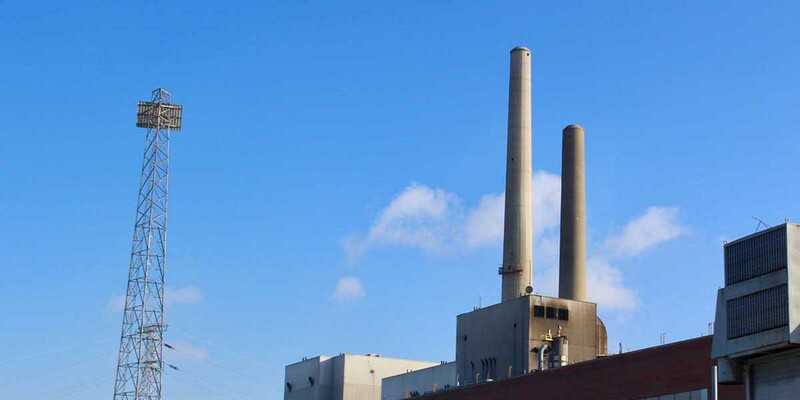 By that time, Michigan’s utilities were already shutting down coal plants and turning to cleaner sources of energy. Schuette also joined other states in fighting Obama’s “Clean Power Plan” — regulations to speed states’ shift from coal-fired power in an effort to reduce greenhouse gas-emissions linked to climate change. The U.S. Supreme Court stayed those rules in 2016, and President Donald Trump’s administration has since moved to replace them. 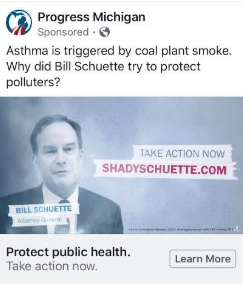 Schuette was involved in two lawsuits — one of which he spearheaded — in which he supported the position of coal-fired power plants, whose emissions, studies say, can cause asthma and other health effects. Schuette frequently highlights the suits, saying they saved jobs and pushed back against overzealous regulation. He, of course, doesn’t mention pollution. Asked by Truth Squad about Progress Michigan’s ad, Schuette campaign spokesman John Sellek noted Schuette’s temporary court victory in the mercury regulations case and issued this statement that does not mention coal or pollution. This article does not contain accurate environmental health sciences statements and analysis addressing the matter of coal plants and asthma. First, coal fired power plants are not significant sources of formaldehyde, benzene, and chlorinated dibenzo-dioxins/furans. Toxic air pollutants are not considered the causative agents for asthma exacerbation. Asthma is strongly correlated with elevated atmospheric exposure to PM-2.5, sulfur dioxide and ozone...pollutants which your analysis completely ignores. PM-2.5 is both directly emitted by coal plants and is formed from atmospheric transformation of sulfur dioxide and nitrogen oxides. Ozone is not emitted by coal plants but forms from atmospheric transformation from nitrogen oxides (emitted by coal plants) and volatile organic compounds. All criteria pollutants which are associated with coal plants and asthma can be controlled at these plants using state of the art emission controls on coal plants, including wet or dry scrubbers, selective catalytic reduction, fabric filters and electrostatic precipitators....as DTE Energy presently uses these technologies at the largest coal plant in Michigan.....the Monroe Power Plant.